Disneyland Paris has just issued an official Press Release with lots of details about the new Mickey and the Magician show, coming to Walt Disney Studios Park this July 2016. This unique and brand new show will feature Mickey and his friends and will take place in Paris at the turn of the 19th century! Entertainment just keeps on creating new surprises at Disneyland Paris®. 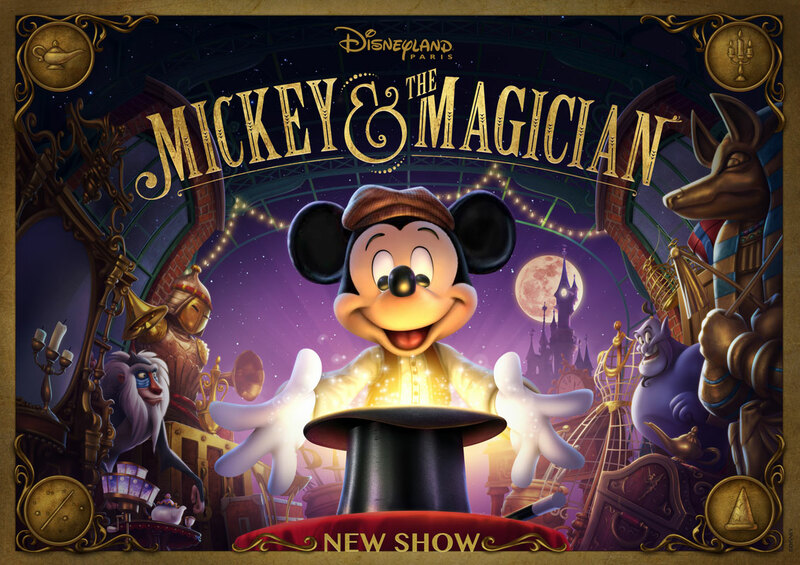 This summer, the public will be able to enjoy »Mickey and the Magician« for the first time. This show, specially created for Walt Disney Studios® Park, will star the mouse who started it all. To illustrate this return to where the magic all began, the creators of »Mickey and the Magician« draw inspiration from the great illusionist Georges Méliès and the famous magician Robert-Houdin. This is not a traditional magic show. The illusions will form the basis of this brand new story. Disneyland Paris has called on the acclaimed magician Paul Kieve to create these illusions. “It’s hard to think of the word ‘Disney’ without also thinking of the word ‘Magic’. I became fascinated with magic when I was 10 years old and was always inventing ideas in my head. One of the great things about working on ‘Mickey and the Magician' is that I can bring some of these ideas into reality!” said Paul Kieve. The Fairy Godmother from Cinderella unveils her famous spell, Bibbidi Bobbidi Boo. Rafiki, the mandrill and great mystic from The Lion King will remind him of the meaning of »The Circle of Life«. The Genie from Aladdin performs an eccentric number for him to the tune of the famous song »Friend Like Me«. Lumière, the French candlestick from Beauty and the Beast has a surprise in store for him with his new enchanted version of »Be Our Guest«. Finally, Elsa, from Frozen, will show him how to…»Let It Go«! He will learn from each in turn as they share amazing magical moments with him, to help him discover the true meaning of the word »magic«. The unforgettable songs that helped to make each of these major films such a success have been specially reorchestrated. »Mickey and the Magician« promises the audience great music featuring completely unexpected sounds. For example, »Be Our Guest«, the star song from Beauty and the Beast, will feature the sounds of the circus; while »Friend Like Me«, sung by the Genie from Aladdin, takes on a Broadway style, integrating tricks and tap dancing. The show also features a brand new song. »Mickey and the Magician« will make its debut on 2 July 2016 and will run until 8 January 2017. There will be several Franco-English shows per day at Animagique® Theater, Toon Studio®, Walt Disney Studios® Park. »Mickey and the Magician« sees Mickey take on a different role and gives the audience another opportunity to see the stars of Cinderella, Beauty and the Beast, The Lion King, Aladdin and even Frozen come to life on stage. A funny, musical, mischievous and moving show… full of illusions! Bibbidi Bobbidi Boo! Although we are excited to see this brand new show – and from all what we can see it will be a great show and a wonderful addition to Disneyland Paris’s show portfolio – we are also saddened a bit, because “Mickey and the Magician” replaces our beloved Animagique.